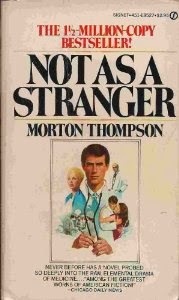 Morton Thompson (?-1953) is hard to find information on. The only print source of information I have on him doesn’t have a birth year. The Wikipedia page and other online sources have his birth year down as circa 1907, but there’s no certainty that that’s accurate. What I have found on Thompson is that his first work was a non-fiction humor collection titled Joe, the Wounded Tennis Player which was popular with soldiers in the Second World War. In 1949, he published The Cry and the Covenant, a fictional biography of Ignaz Semmelweiss, the nineteenth century doctor who was forced out of the medical community with much hostility. Semmelweiss had the crazy idea that doctors should wash their hands between the morgue and the delivery room. Thompson committed suicide in 1953. His last and most successful work, Not As A Stranger, was published in 1954. That’s the sum of the information I’ve been able to verify about Morton Thompson. If anyone has another source of information, please leave a comment. Not As a Stranger tells the life story of Lucas Marsh. Born in a small town in the Midwest at the beginning of the twentieth century, Lucas is the son of a successful businessman and a devout mother. Despite his parents' wishes, Lucas wants nothing more in life than to become a doctor. His mother dies, and his father's business collapses around the time Lucas is going to medical school, leaving him broke as well. Lucas marries an older nurse for her money and the story from then on is half drama, as Lucas becomes a great doctor but a bad person, and half exposé of the medical industry. It seemed like this was two different books. On one hand, a look at the inside of the medical industry, and on the other, a drama about the costs of success. The former doesn't require over a hundred about the narrator's childhood, and the latter doesn't require the amount of technical information present in the novel. Given the length of the book, it frequently felt like things were not really leading anywhere. For example, we know from the beginning that Lucas is going to be a doctor. On page four, the last line of the first chapter reads: "Lucas Marsh was born in the town of Milletta in the early 1900's, to Job Marsh, owner of a harness store, and Ouida Marsh, daughter of a druggist. He was to be a doctor. No more is known." Of course, more is known. 944 pages more. The story has some strong points, most notably the vibrant supporting characters. Lucas's mother is a Freudian minefield. The first time we're introduced to her, she's sitting at the kitchen table reading about phrenology (the pseudo-scientific belief that skull shape affects personality traits). The seven year old Lucas comes in and Ouida measures his skull, noticing a bump that indicates "pronounced amativeness." She tells Lucas that that means "playing with yourself." She goes on: "You must never play with yourself, Lucas. Remember that, always. And if you do, you must tell Mother. Always." She goes on a page later to tell Lucas that "Mother has such great dreams for you, darling. You're Mother's whole life, you know. Never forget that. Mother wants the little boy she suffered such agonies to bring into the world to be a great artist, a spiritual being the whole world will look up to." The father is not as unsettling, but still a strange personality. His name is Job, as I've mentioned, which also happens to be where the title is taken from. The epigraph for the novel is "But as for me, I know that my redeemer liveth, and at the last he will stand upon the earth, and though worms shall devour my flesh, and my bones be as dust, yet Shall I see god, whom I shall see for myself, and mine eyes shall behold him, and not as a stranger. Job, 19;25" The naming isn't particularly subtle. In fact, the mother's maiden name is "Bourgeois." And of course, the name Lucas/Luke has biblical significance. On the one hand, there's Lucas's father who is not spiritual at all, who sleeps around and is predominately interested in making money. The mother is spiritual to the point where she almost kills Lucas as a baby because she refuses to listen to doctors. And Lucas learns to strike a balance between the two. The film starred Robert Mitchum as Lucas Marsh, alongside Olivia de Havilland and Frank Sinatra. This was the directorial debut of Stanley Kramer. As an exposé of the medical industry, the story is very dated, which I feel detracts from its strength today. It's not a bad novel, but it's not great either. It's too long for its subject, even if there are bright points scattered throughout. Not As a Stranger appears to be out-of-print, but unless you have a burning passion for doctor stories, it's not something you need to go out of your way to look for. Server, Lee. Encyclopedia of Pulp Fiction Writers. New York: Facts on File. 2002. Print. Thompson, Morton. Not As a Stranger. New York: Scribner's. 1954. Print. When I read it -it was in the 1950's. Back then I was around nurses and embalmers and we all knew what "cancer" was off the record. The Doctor Frank Sinatra played was not that sharp. A young woman had a mole and she wanted it removed. He took the mole off but it was a "Melanoma". Mitchum, being ultra doctor, is furious that Frank took it off but he never discussed the case and there it was out in the open. Back then people were terrified and wouldn't even talk about it. The sooner you got to it the better off you were. During this time frame Bogart died form it and Allen Duelles went with Cancer of the Bladder I think. There wasn't much of a cure rate. I hate the disease because it runs in my family. The book is an "Admitting Diagnosis" type book. If you life is on the line you need a final diagnosis of what you really have. I enjoyed "The Diary of Intern X" better. I went on to work with Cancer Patients at a big hospital in inhalation Therapy and we had some really fine doctors who worked together. Cancer is an extremely difficult disease to diagnosis and these doctors had each others back. 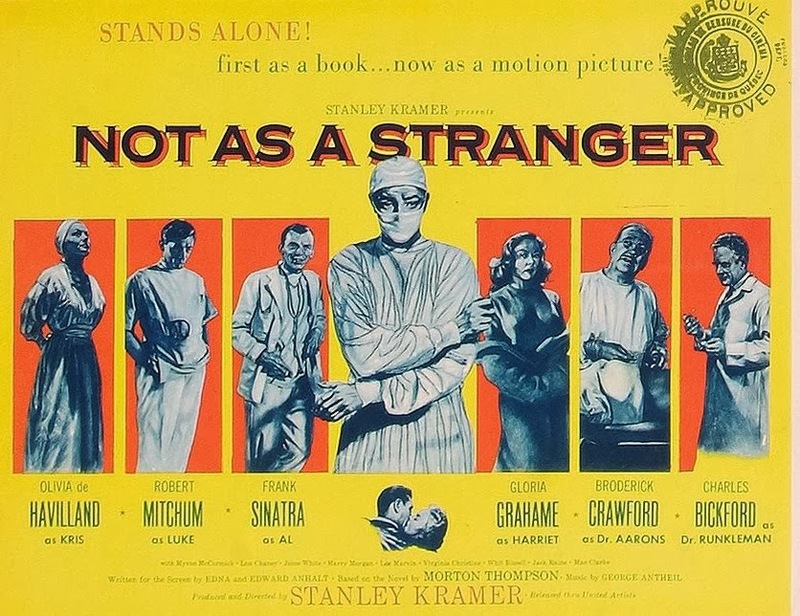 We had a much higher "cure" rate than the crew in "Not as a Stranger" would have had. I just want to forget the forties and fifties. Women were better cancer patients than men back then.